Make sure to watch it till the end… This is HILARIOUS. Cats are unlike their canine counterparts – they are known to be highly intelligent and independent, even though they do love a treat or an occasional pat. It is all up to the cat’s personality, of course! 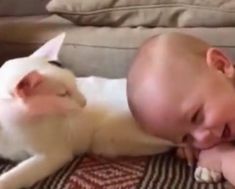 But behind their ‘unloving’ facade, cats are actually very sweet in their own way – like these cats who are caught on tape mimicking human actions! What you’d never expect to happen has now came true – cats are now taking our place! Here, you’ll see cats sitting at the table and acting like humans going about in their daily activities! This is akin to the movie ‘The Secret Life Of Pets’!